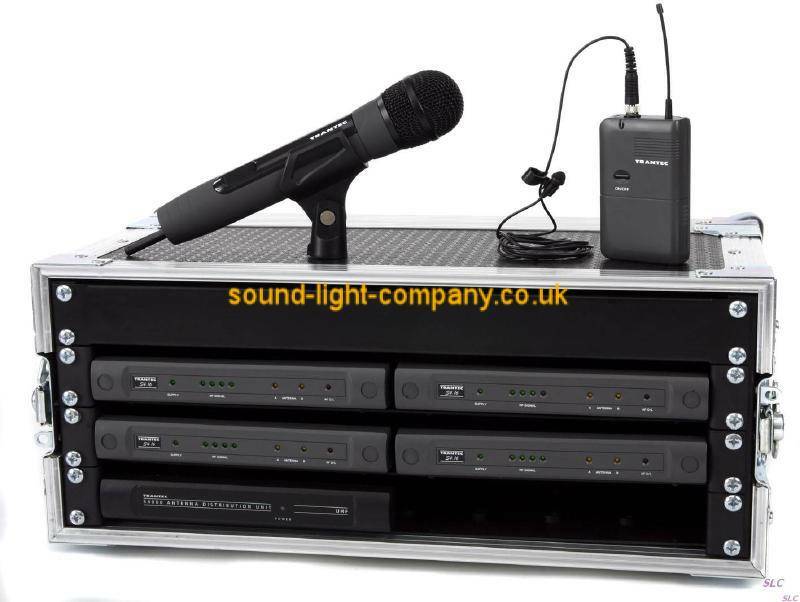 4 WAY TRANTEC S4.16 RACKED n READY RADIO MICROPHONE SYSTEM - available with any combination of handheld / beltpack transmitters (please state your preference in notes box when ordering). The new Trantec S4.16 UHF system boasts a multi-function receiver, 16 selectable frequencies and the latest PLL quartz tuning technology, making it the ultimate choice when looking for a product that will address your demands now, and into the future. The S4.16 gives the user the ability to run more frequencies, but we realise this means a potentially intimidating tangle of wires to connect if the antennae are to be distributed from a single pair. We have therefore come up with various assembled racks giving the user a "turnkey solution" for a set price. Included in this price are the receivers and transmitters (in any combination of beltpack or handheld), a professional quality 19 inch rack, power supplies, antenna distribution units, antenna head amps, 10m of antenna cable, antenna mounting kit and antenna stands. These come in 4, 8 and 12 way versions.